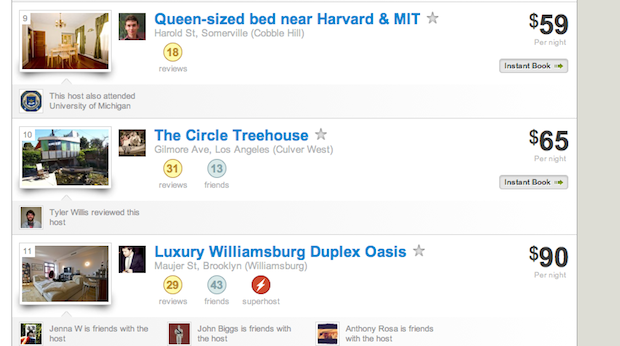 There are dozens of reasons why Airbnb is awesome. Take its truly disruptive model, for instance. Or if that doesn’t do it for you, how about the fact that you can use it to rent entire countries? But if there’s one weakness with the service, it’s that using it for the first time can be a bit unnerving. Who am I staying with? How do I know that their apartment isn’t really a dump? Reviews and ratings take care of some of this, of course. But a new feature should help users feel much more at home immediately: Social Connections. Airbnb Social Connections allow you to hook up the service to your social graph via Facebook Connect. Click one button, opt-in, and you’re good to go. 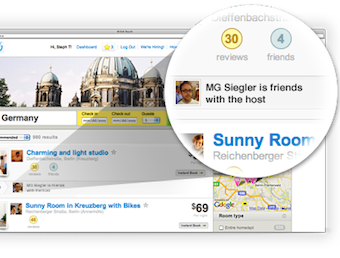 In the listings for cities around the world you’ll now see an avatar if a Facebook friend of yours is friends with the host or has reviewed the host. It’s absolutely brilliant. And it goes even farther. Say you don’t necessarily care if someone you know is connected to the host, what if you just care that you have something in common? Like say, you have the same alma mater? Airbnb Social Connections surface that information too! Privacy is Airbnb’s priority: personal and private information are protected at all times. Social Connections are only displayed to those already in your social network. Turn this feature on or off at anytime with a single click. “This has been one of our most requested features, particularly for people that want to have something in common with the people they are staying with,” co-founder Brian Chesky tells us. “Social Connections helps you find places to stay with mutual friends, people from your school or university, or hosts that your friends stayed with and recommend,” he continues. Chesky quickly glanced at my account and noticed that I would have about 40 applicable connections already. When I turned it on just now, sure enough, there are places being rented out by people who know others that I know. Or there are others that went to the same school as me. Again, this is awesome. Chesky notes that there are already 16,516,967 such connections based on current members of the service. That will only grow as the Airbnb community does. There are already 5,229 colleges/universities with alumni listings on the service — the biggest schools in that regard so far are Columbia, Harvard, Berkeley, and Stanford, we’re told. Yet another reason to love Airbnb.